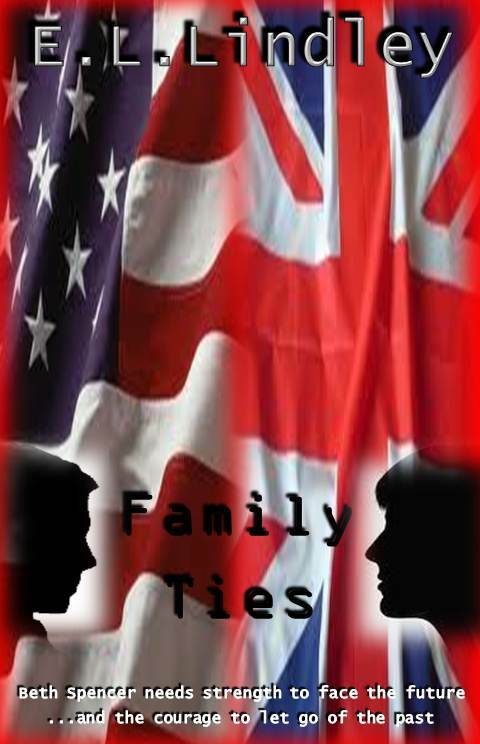 Family Ties came about a little bit differently to E.L. Lindley's other novels as it was written with the intention of submitting it to Harlequin Romance publications. However, in her typical fashion, she didn't bother to research the criteria for the kinds of stories they would be interested in. Consequently, after submitting it she received a very encouraging response that the story was engaging and well written but didn't fit in with any of Harlequin's romantic categories. Re-reading the story, E.L. liked it and thought maybe readers might want to give it a chance. It is shorter than her other novels because of the word limit for Harlequin which could make it the perfect introduction to her other work. is. Going through her mother’s possessions Beth finds a trail that leads her from her comfortable life, as a successful artist in Edinburgh; to a father she has never met in LA. As her father’s family welcome her into their life, Beth’s world is complicated even further by her feelings for her father’s stepson. Cal Anderson offers Beth the chance of a new life but can she find the courage to let go of her old one? Why not try the first chapter and meet Beth Spencer? irritating woman sitting next to her. Sadly the gesture was as futile as it was desperate since the woman seemed to be under the impression that Beth was pressing herself against the window in order to make more room for her own rather ample proportions. The woman spread herself deeper into her seat and Beth felt her stomach tighten in silent protest. It was then that she was struck by the absurdity of the situation, here she was probably at the most significant point in her life and the only thing she could think about was the woman’s heavy thigh pressing into hers. and she knew if she was to make a new start she would have to shed her social reticence and general intolerance of her fellow man or in this case woman. barely even set off on her new start and she had already slipped back into her old ways. Beth thought back over the past year; a year that had wrought so much change, it was hard to believe that it had really happened. Her mother had died after a short illness, which had seen her plummet into a period of shock and depression. However, in some ways what had come after that had been even more cataclysmic. taken only two weeks off work when Beth was born, without ever missing a day before or since. developed, Celia was mortified that her daughter seemed to be nothing like her. Beth was a sensitive, imaginative child who excelled in art and Celia saw it as her job to punish her for this. The only trait that Celia and Beth had in common was their stubborn tenacity and it was this that had prevented Beth from being totally cowed by her mother’s dominance. She had thrived at school and when the time had come to apply to universities, she had rejected her mother’s plans for Oxbridge and instead forged her own path which led her to pursue a degree in fine arts at Edinburgh University. She had chosen Edinburgh only for its location, as a place which would take her far away from London and more importantly far away from her mother. The two women grew further and further apart with Beth finding excuses not to have to return to the cold, foreboding family home, dreading the feelings that it induced; anxiety, claustrophobia and the cloying fear of having to spend time with her mother. Her career had taken off, she pursued teaching to subsidise her real love of painting and eventually gained a post at the university as artist in residence. Her life had seemed at times almost idyllic until the phone call came. The phone call that summoned her back to London. It said it all as far as Beth was concerned that it was her mother’s PA who called her early one morning with the news that her mother had end stage ovarian cancer. In true Celia style, she had struggled on; ignoring symptoms until it was too late and all that was left was for Beth to return to their joyless home to nurse her until her death at the age of sixty. There had been no deathbed reconciliation, Celia died as she had lived; giving nothing of herself and demanding of Beth only that she do her filial duty and nothing more. If Beth tried to show her mother love or affection, Celia made it clear that she did not want it. Once her mother died, Beth was left feeling numb and terrified by the lack of devastation but how could she miss something that had never been there in the first place? and for the first time in her life she had nothing that she needed to be doing or any place that she needed to be. It was whilst she was sorting through her mother’s belongings that she made the discovery which was to change her life completely. She found packed away amongst her mother’s paperwork, as though no more significant than an insurance policy or a bank statement, two letters. They were addressed to Celia and were written by a man called Daniel Marshall, with a return address in Los Angeles. It was the content of the letters, however, which were to shatter Beth’s life as she had known it for the past thirty two years. The first letter, postmarked February 1979, was a response to Celia having informed the man that she was pregnant. Her mother would have been twenty eight and, judging from photographs that Beth had seen, already a staid, joyless woman. Beth had no idea how old Daniel Marshall had been at the time of writing but he sounded young and the news obviously hadn’t been welcome. It seemed that Daniel had been sent from LA to work temporarily at Celia’s company but Beth couldn’t even begin to imagine how he had ended up in bed with her mother. It had been, judging from the letter, a one off affair and bitterly regretted by both parties. Daniel Marshall had ended his letter by offering financial assistance and nothing more. event was in no way connected to him, expressing regret that Celia had declined his offer of financial support. He ended his letter by wishing mother and baby well. had got the letters out again. She had read them over and over, late into the night, reflecting how this man – Daniel Marshall, about whom she knew absolutely nothing, was now her only living relative. She had existed for so long without any sense of family, she was shocked when the thought began to niggle at her; small at first, just a fleeting observation but then more and more it came to consume her thoughts. not entirely sure that she even wanted this much connection with the man, she clicked on the link. Sitting back in her chair, she exhaled loudly, unaware that she had been holding her breath whilst reading about Daniel Marshall aged fifty eight, who not only worked at the same company as he had all those years ago but was now CEO. He resided in Rustic Canyon with his wife of twenty years, Sharon. There was a picture of the two of them at a black tie function and they made a handsome couple. Beth stared into his face, unable to comprehend that this man with the weathered, masculine face and clipped short grey hair, was her father. His face looked open and kind; he was smiling, his eyes crinkling with sincerity, as he gazed lovingly at his blonde wife. Daniel Marshall, at the company which he now seemed to own. It was a simple letter, setting out merely who she was and informing him of her mother’s death. As soon as the letter was posted, Beth had the desire to somehow wrench open the red post box and grab it back. She felt a deep icy fear at the very core of her being, knowing that she had set in motion a chain of events that could turn out to be catastrophic for everyone involved.